If No. 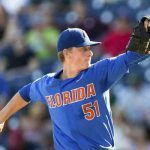 1 Florida Gators baseball has any chance of defending its lone national championship, it’s now going to need to win two extra games for the opportunity. The No. 9 Texas Tech Red Raiders made easy work of the Gators on Sunday night, opening the 2018 College World Series with a clean 6-3 win over the top team in the country. 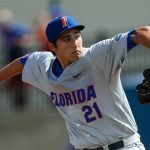 In a game delayed nearly three hours due to weather at TD Ameritrade Park in Omaha, Nebraska, Florida could never get it going offensively while failing defensively behind junior right-handed pitcher Brady Singer. The Gators’ ace all season and a first-round selection in the 2018 MLB Draft, Singer (6.1 IP, 9 H, 5 R [2 ER], 5 K) did not have his best stuff. It may not have mattered much even if he was slightly better. Though Florida was only tagged with one error on the day, it committed plenty more miscues defensively and was unable to rally at any point in the game. The Gators were 1-for-15 hitting with runners on base and 0-for-8 with runners in scoring position, leaving eight on base. Florida’s lone runs came via balk in the third and two-run homer by junior designated hitter Nelson Maldonado. The untimely defeat sends UF into the loser’s bracket of the CWS where it will face No. 13 Texas on Tuesday at 2 p.m. ET. 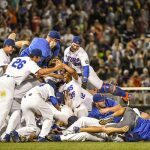 Including that game, Florida would need to win four additional games over five days in order to return to the CWS Championship Series in an effort to defend its title. If the Gators had won on Sunday, they would have only needed two additional victories to advance. Head coach Kevin O’Sullivan will likely start junior RHP Jackson Kowar (9-5, 3.24 ERA) on Tuesday.